Nothing looks and feels like wood. Because it comes from the earth and was a living thing at one time, it seems to liven up any room where it is installed! It has a warm feeling to it and a warm look with its golden, white, and reddish tints. Not many types of flooring give the quality of flooring and add that vibrant feel at the same time. Most hardwood floors are extremely durable and have the ability to last many decades, if not more. The durability of hardwood floors vary from type to type. There are different levels of hardness within the various hardwoods. This plays a role in how well the floor will resist damage over its life. There is what are considered “hard” hardwoods. Oak, Redwood, and Rosewood, are a few hard woods. Pine, mahogany, and cherry are considered softer hardwood species. Hard woods generally grow from trees with broad based leaves. Soft hardwoods typically grow from trees with pine needles such as pine, spruce, and cedar. If you plan on installing hardwood floors, you should be comforted in the fact that the expense will not be a sunken cost. 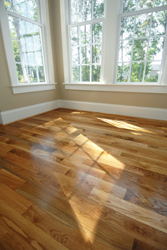 Actually, installing hardwood floors will greatly increase the value of your property. Not only does the value of the home rise, but homes having hardwood floors tend to sell much faster than homes which do not contain hardwood flooring, too! The other benefit about installing hardwood floors is that they are coming out with many eco-friendly options for today’s homeowner. Engineered floors use much less wood by only using the actual wood for a maximum of 1/16 of an inch of thickness on each board. The remainder is made from High Density Fiber, HDF. This cuts down greatly on the amount of trees that need to be felled. Also, very popular today is the bamboo flooring. This flooring is not actually wood, but grass, which makes it a green choice if you are purchasing new hardwood floors. There is a plethora of styles of hardwood flooring to choose from, and thus, you can select one that suits your home’s interior décor and appearance. There is more to choose than just oak or pine. There are exotic woods, domestic woods, specialty woods, and woods with every type of coloring you can imagine. You can have a wood floor that is almost white to black.